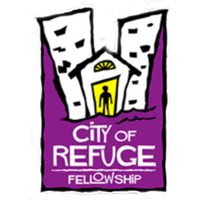 At City of Refuge Fellowship we have a vision of reconciliation. We believe that God desires to reconcile all men first to Himself and then to one another. We are called to be ministers of that reconciliation through passionate prayer, intimate worship, devotion to God’s Word and humble servanthood. We are confident that through God’s mercy we will see unity in the Body of Christ, restoration of families, healing for the broken and justice for the abused. Our vision is to take part in the triumph of mercy over judgment and to see the glory of the Lord as it rises upon our city. All things begin and end with God’s Word. We believe that all Scripture is “God-breathed”, to be taken literally and applied to each of our lives as the guide for all beliefs and actions. The Apostle Paul wrote that we are to “pray without ceasing”. Jesus made it very clear that all things are possible through praying by the leadership and direction of the Holy Spirit. James wrote that “the effectual fervent prayers of the righteous avails much.” We believe that we have been given a great opportunity to seek God and to see Him answer through prayer. Prayer is our first calling, our first action and our first joy. All that we do must be birthed in and then covered by prayer. Through worship we have been given the opportunity to draw close to God with the promise that He will draw close to us. Scripture tells us “the Lord inhabits the praises of His people”. We believe that worship is a time in which we can look beyond our circumstances, our needs and our wants and be enveloped by the absolute sovereignty, beauty and goodness of God. We believe that worship is to be led by God’s Spirit, it is not for our pleasure but for God’s. It truly is our gift to Him and it must be pure and holy. The Psalmist wrote, “How good and pleasant it is when brothers dwell together in unity.” We believe that God desires unity in the Body of Christ. We recognize that there are many differences among us and yet we believe that having Jesus as our Lord and Savior soothes those differences and gives us a much greater common bond than anything that could separate us. Jesus made it clear to His disciples that the world around us would know we where His disciples by our love for each other. I Corinthians 5 tells us that we have been given “the ministry of reconciliation.” We believe that this is one of our chief callings and that obedience to God’s Word, prayer, worship and unity will open doors for us to live lives that are first reconciled to God and then to one another. We do not believe that God created man to be broken, separate and divided. Sin is the cause of division, it separated Adam and Eve from the Garden of Eden, it separated Cain from the rest of his family and it has separated us from God and from each other. We believe that salvation through Jesus first reconciles us to God, then it also has the power to reconcile us to each other. It is our desire to be able to live and lead others into lives that are first and foremost reconciled to God and then reconciled to each other. Jesus came to earth as the King of Kings and yet He chose to live as a servant to man. We must follow His example and serve our Father by serving those around us. When Jesus washed the feet of His disciples He told them, “For I have given you an example, that you should do as I have done to you.” We believe that God expands His Kingdom through Christlikeness, to be like Christ is to be willing to serve those that He brings into our lives. JIsaiah 53 says “By His stripes we are healed.” The Bible gives many examples of healing and many promises of healing to come. We believe that healing is a part of the atonement that Jesus won for us when He endured the cross and rose from the grave. Healing is in the hands of God, He is not only able to heal but He is willing. We believe that we are called to pray for healing of the body, the mind, and the soul. There is nothing that has been done to us or by us that God can not redeem and use for His glory and our good.